The Heron River subdivision is located in beautiful Star, Idaho. Nearly 44% (75 acres) of the community has been preserved as an improved open space. Available to residents, the open areas include neighborhood ponds and greenbelt pathways throughout the community. The neighborhood, situated just north of the Boise River, was named for the numerous Blue Heron nests that line the river bank. Read more about Heron River Real Estate. Browse all new homes in Star or find your perfect community with our complete guide to new subdivisions in Star, Idaho. The community offers 575 homesites and a variety of price ranges. 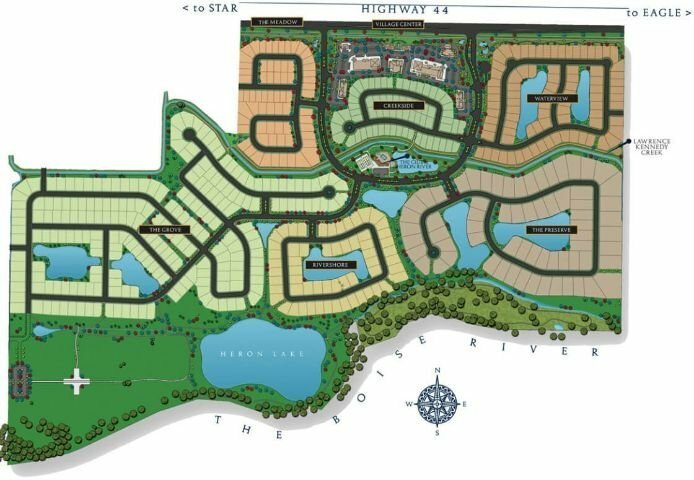 Comprised of seven defined neighborhoods, construction of Heron River real estate began with Meadow and Waterview phases. From the beginning, much thought was put into achieving architectural diversity while maintaining an overall community aesthetic. Homes for sale in Heron River are available in five distinct, yet compatible, architectural styles for its builders to use as inspiration for their designs. The intent was to avoid the rows of cookie cutter homes you see in many subdivisions today. Porches are encouraged, when appropriate, to promote the casual atmosphere and walkable characteristics of the Heron River community. Characterized by its unique design, landscaping, and water features, The Village Center at Heron River provides a vibrant, yet tranquil setting. Residents and locals can enjoy relaxed outdoor dining in the plaza and shopping with a "small-town life" feel set against the backdrop of Boise River. From Eagle Rd, head West on State St (ID-44) for 6.1 miles. Turn left (south) on S Plummer Way to Heron River - Star, ID 83669. Questions? Contact us today to get started on the journey to your new home - (208) 391-4466.